The holiday season is here again…don’t forget your favorite feline friend! Handcrafted at Dalby Farm, each catnip Christmas Mouse kitty toy is made from different holiday themed cotton fabrics, designed especially to put any kitty into the holiday spirit. Festive fabric is a great but when she gets a whiff of the catnip, her fun is just beginning! Not only is the mouse stuffed with catnip but also, to extend the life of the toy, it is packaged in a small ziploc bag with additional loose catnip. After kitty plays for a while, be sure to put the catnip Christmas mouse back into the bag so that the catnip scent can ‘recharge’. Every house with a cat should have one; lots of feline fun! This fun little catnip Christmas Mouse kitty toy, handcrafted at Dalby Farm, is sure to be a hit with your favorite feline friend. Crafted from festive, holiday themed cotton fabric, with color coordinated yarn tail. Our cat Ellie Mae, loves her catnip Christmas mouse. If I make the mistake of leaving the bag on the table, it is not too long before she has jumped up and grabbed it! One time, when I didn’t realize that she had taken it, I encountered a trail of catnip going from room to room. At the end of the trail, I found the plastic bag that the catnip Christmas mouse stays in, all chewed up with holes throughout and totally destroyed. Next to it was Ellie Mae, sprawled out on her back, ‘holding’ the catnip Christmas mouse between her paws. She was clearly under the influence of the catnip and appeared to be completely enjoying herself! 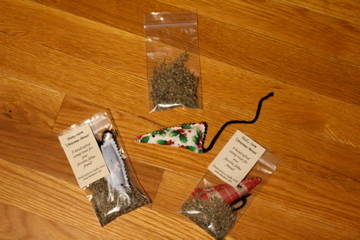 Each catnip Christmas mouse body measures approximately 4″x 2″ and is filled with catnip and minimal amounts of fiberfill stuffing. Due to the hand crafted nature of the item, there may be slight variations from mouse to mouse.